Some pertinent facts: It was about seven miles across the Sea of Galilee from shore to shore where this event took place. That may be a lot more distance than we think about, because many pictures make this sea seem kind of small. The fourth watch of the night was between the hours of 3 a.m. to 6 a.m. 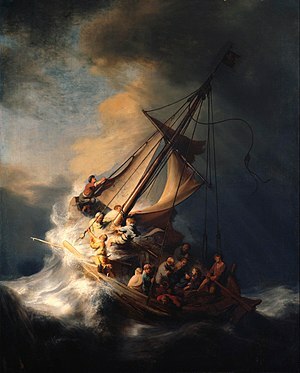 It was a time when folks were usually asleep, so the disciples struggling in the ship were undoubtedly tired and terribly firghtened by the severity of the storm. The word spirit that is used here means phantom. To sailors, it was always a sign of shipwreck and impending doom to see such a thing. And the words cried out literally mean to scream, or shriek. They were afraid. They were not yet the wise men of God who had learned to fear nothing at all. So now you have the picture, I hope. A terrible storm blew up while the disciples were making their way across the water, hoping to meet Jesus on the other side. And yes, from what I’ve read, the storms could get that bad. This is a Rembrandt, and I think it’s amazing. The Sea of Galilee is a huge fresh-water lake, really, and it usually enjoys a moderate climate. Occasionally, though, a storm hits hard and fast. Now, think of being caught in a storm like that in the middle of the night, in the dark, when you’re already weary and needing to sleep. Then, you look out across the water, hoping to see some indication that you’re nearing the shore—and you see a GHOST walking right on top of the water, coming right toward you! Of course you shriek! Of course you think it’s a “spirit”! Of course you are terrified and babbling and thinking of throwing yourself overboard to escape the phantom. And. . . .probably. . . .you can’t swim. . . . .